When I drew up a list of possible blog topics, this new book from the Army Corps of Engineers was an obvious choice for someone like me, who likes to investigate less well- known historical subjects. There were three reasons for me to be interested. Although key to the success of any army, Engineer units tend to labor in the shade of more “glamorous” branches. Also, even though African-Americans made up the bulk of enlisted personnel in World War II-era engineer outfits, their accomplishments are even less well-known that those of the Corps overall. 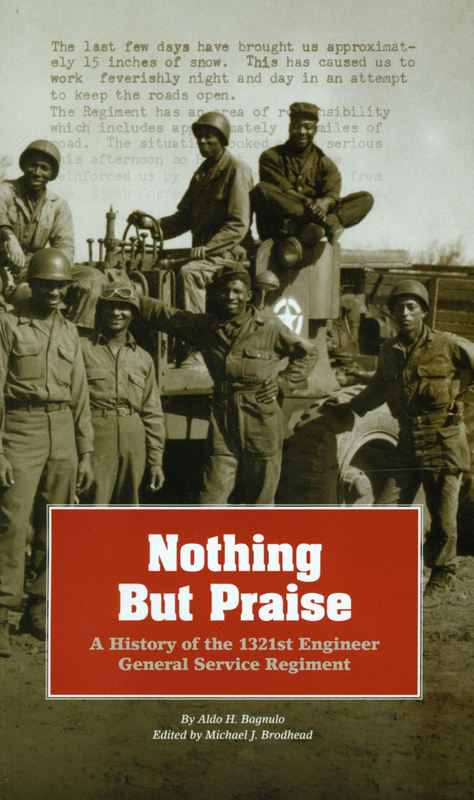 Finally, Nothing but Praise was written by the 1321st’s commanding officer, Aldo H. Bagnulo. It consists of his unpublished history of the unit, a diary he kept during the war, and an extensive array of photographs of unit personnel and activities. (The book was carefully edited and annotated by Corps historian Michael J. Brodhead). The 1321st was an Engineer General Service regiment, which means that its personnel were well-trained in the various building and engineering trades before deployment overseas. The regiment’s job was to build and maintain bridges, roads, and various structures needed to keep wartime supplies stored and supply lines moving. In the course of its service in France and Germany, from December 1944 until several months after Germany’s surrender, the 1321st worked diligently and well in all kinds of weather and quasi-combat conditions in highly creditable fashion, as documented by the receipt of the Bronze Star by six officers and nine enlisted men. Viewed from this perspective, Bagnulo sheds welcome light on the crucial but often neglected role of the Army Corps of Engineers in supporting the logistics of war. Bagnulo’s treatment of the racial aspects of his command is intriguing. His unpublished manuscript never refers to race at all. Reading it out of the context of this published edition makes it sound like every other small military unit – the rigors of training, the weeding out of the less fit, the occasional wild party, terrible weather, back-breaking work, intense fear, and finally a feeling of accomplishment duly rewarded by official recognition of a job well done. In his diary, Bagnulo does mention race a few times. It’s clear that, although a man of his time, he made a conscious effort to eschew prejudice. One issue he cites as productive of tension after V-E Day sprang from his African-American officers’ concern about fairness in promotion; Bagnulo strongly endorsed merit promotion in two meetings with them, which he seemed to think was helpful. He was clearly comfortable with addressing such issues head-on, which must have been unusual in those days. In mid-1945, the 1321st shipped out to the Pacific theater, didn’t get there before the surrender of Japan, and spent several months building roads and bridges in Korea before demobilization. Afterward, Bagnulo had a long career in the Army and at NASA before retiring. The verdict: A valuable read for anyone interested in the sinews of war and the story of race relations in America. Nothing but Praise is available from GPO. For more about the creation of Nothing but Praise, check out this Army Corps of Engineers video. Note: GPO’s Creative Services organization did a great job in designing this book.